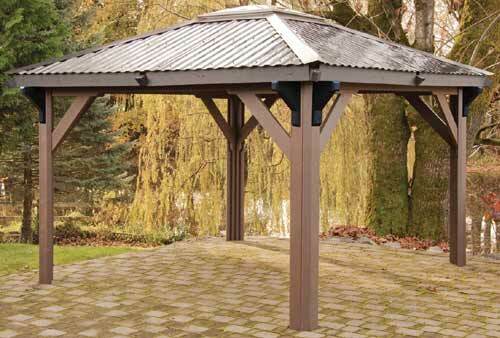 This gazebo gives protection from above and still allows a complete view of your garden. As all Visscher structures, the posts and roof are manufactured with durability in mind. The polyethylene roof includes a skylight for admiring the moon and stars while enjoying your outdoor living area. The corbels add elegance in a classical way, and create a nice accent to our structure. The durability makes the Hamlet the ideal architectural accent to your property.